I talked about CaZa Cafe before, we were in a quick Mac user group meeting and there was a football game on the screen. We didn’t watch the game but we were charged %30 “tax” for something we never agreed to. Apparently that activity is illegal but no one cares. 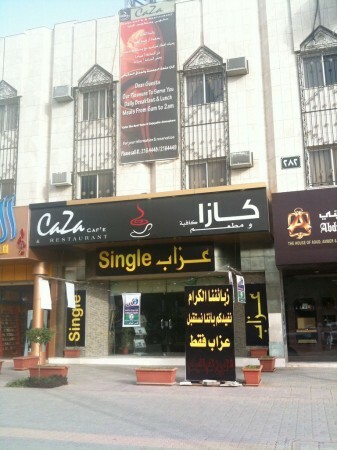 CaZa Cafe switched their target market to “Families” from “Singles” over a year ago. I thought they will fail just like Joffrey’s Coffee who closed their Tahliah St branch months after a switch to families. A few weeks ago CaZa Cafe decided to ban families. So they hanged these posters, sign said “Dear customers, we are now only accepting singles now”. They also hanged some world cup posters. So the management of CaZa Cafe decided that they will have better profits by charging people “%30 world cup tax” for merely staying there during a World Cup game. Please remember that this is legally questionable. If a coffee shop suddenly asks you to pay extra and they never disclose it then I urge you to refuse to pay them that extra amount! Java Time (Java Time, used to be Coffee Time and Y Cafe) started as a small coffee shop by the owners of Softland computer hardware store. This is supposed to be their homepage but there’s nothing. It used to be a decent coffee shop but lately they opened a branch in every street, the coffee quality changed dramatically and bad seating. Black drip coffee taste old, espresso feels burnt, their “popular” drinks are just covered in sugar and sweeteners so nothing to taste. Apparently you need to get used to it to like their coffee, no thanks. The seating in every branch is extremely congested, there is no open space and if the branch is full then prepare for the bad smells. Most coffee shops keep an open breathing space between seating areas to make it a comfortable place. Don’t bother conversations with your friends because everyone is talking, it’s louder than a noisy classroom. Did I mention the smell? At least they don’t allow smoking. Internet: their Internet policies changed so much: pay 10SR for 1 hour or 50MB bandwidth, free for 20 minutes using a card that you ask for each time and apparently they made a deal with STC to provide free Internet. Please note that it’s an open access point so take caution. Gowalla locations in Riyadh: King Abdulaziz rd, not sure, heh, Tahliah rd, Mecca rd, Takhassusi st and King Abdullah rd. In the end, it’s definitely not a recommended place by me. Unless you want to order a french latte (loaded with sweeteners) and other similar drinks. If you want real black coffee or espresso that’s good then you are at the wrong place. It’s a shame really since it’s one of the 2 local coffee shop brands (the other is Dr Cafe) and both offer horrible coffee. I only noticed this coffee shop a few weeks ago but apparently Caribou was open for over 2 months. This is Caribou’s first branch in Saudi Arabia. Caribou is the second largest coffee shop chain the US after Starbucks. I’m not much of a food critic but I enjoyed their brewed coffee. Their lattes and smoothies are also good. One of the better coffee shops in Riyadh. Caribou’s shortcomings in my opinion are: the lack of wireless Internet (I hope that they will add a wi-fi access point soon) and no bakery, what they offer now are below average. I also noticed that the Saudi Arabia branch is missing from Caribou’s website (they are open in Bahrain, Kuwait, Jordan and UAE). Caribou Coffee is located at the intersection of Olaya Street and Imam Saud bin Abdulaziz Street in Riyadh (Google maps link). Family section is available. Here is the Gowalla location for Caribou Coffee Riyadh. Free Wi-Fi Internet access. You can ask the waiter for the password. Full smoking area. Get ready to go home smelling like a cigarette. They charge you 30% service charges! if there was a soccer game on the TV, even if you weren’t watching it! I was there tonight attending a “Macintosh Event” right before the game started. And I had to stay to get some work done and didn’t really care for the soccer game. When I got the bill I was charged 30% extra service charge for sitting there! I called the number on the recipe which was the manager’s number and he told me that they charge that if you stayed to watch the game. He also claimed that they won’t charge if I stayed in the chairs outside the cafe (which there weren’t any!). That was my personal experience which will probably not encourage me to go there again! In the end I give that coffee shop a 1 out of 5 rating. The Lack of non-Smoking section as well as my previous experience were really discouraging and I would avoid that place if there were a soccer game on the TV!